Yeast breads rising in bakeries, the scent of grilling tacos in the streets, steam rising from tamale pots and a rich chocolate scent emanating from foamy milk…follow your nose in Mexico City. The streets are a constellation of smells that enchant tourists and long-term residents alike. Everywhere you turn there’s something to eat: restaurants on corners and in between, food stands at every conceivable location (in front of schools, businesses, subways, etc), small tiendas with snack foods tucked into their nooks and crannies and still more food at any event you attend. One of the most delightful, tasty, and economical meals in Mexico is the Comida Corrida (“meal served all day”), a four-course meal offered usually between 1 pm and 5 pm. The fixed price for a Comida Corrida runs anywhere from 35 to 100 pesos per person. When you’re seated, you’ll first be brought a pitcher of agua fresca, water made with melon, strawberry, papaya, pineapple, orange, or jamaica, the ruby-red hibiscus flower tea. Next is soup followed by a plate of rice (sometimes topped with bananas or other surprises). Then comes decision time: choosing your main dish, which change daily. Popular main courses include meatballs in chipotle sauce, beef steak, chicken pipian (a creamy green sauce made from toasted pumpkin seeds), chile relleno, enchiladas or vegetarian souffle. If you want to know where and what the locals eat in DF, this is it. Look for Comida Corrida in small, family-owned restaurants in neighborhoods where there are office buildings…because workers enjoy their main meal of the day in these locales. A popular street for Comida Corrida is Rio Lerma in Colonia Cuauhtémoc. It’s just a block off of Paseo de Reforma, close to the statue of the Ángel, making it a perfect place to take a break from sightseeing. Cardenal, at Palma 23 en Centro Histórico, is known for some of the finest traditional Mexican food in the city. Because of its popularity and sterling reputation, there are often long lines spilling out of the restaurant and onto the street. But no one minds waiting for the truly traditional hot chocolate, served from a jarra and whipped with the traditional wooden pala, as well as their homemade sweet breads. Patricia Quintana is a name known not only in Mexico, but throughout the culinary world. 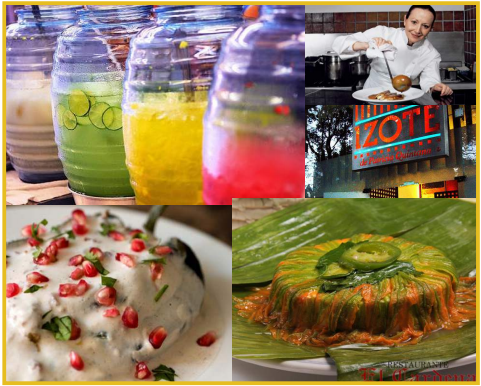 Serious foodies will set their compass to go directly to her restaurant Izote in Colonia Polanco. Be prepared to spend a good portion of your allotted food budget here, but for those dedicated to the fine art of eating, vale la pena (it’s worth it). Ms. Quintana serves modern versions of pre-Hispanic dishes, using indigenous ingredients such as yucca flower cactus, and corn flower. Another of the most distinctive and famous restaurants in the city is El Bajío, the creation of Carmen Ramirez Delgado and her late husband. The New York Times has called Ms Ramirez and Ms Quintana “the Matriarchs of Mexican Flavor.” Influential Spanish chef Ferran Adrià called El Bajio “the best restaurant of Mexican cuisine I have been to in my life.” Carnitas (literally ‘little meats,’ braised or roasted pork) is a specialty. Apart from the or iginal establishment in Azcapotzalco, there are five branches located in Parque Delta, Reforma 222, Polanco, Lindavista, and Tezontle. On the lookout for good Oaxacan food? Try Bella Lula (there are a couple of locations in the city, one on Rio Lerma). Here you’ll also find one of the tastiest Chile en Nogada in town, served only late July through September when granadas (pomegranates) are in season. This is the chile that’s dressed up like the Mexican flag, the green poblano chile stuffed with a meat and nut filling and topped with a beautiful white sauce and granadas. Along with the influx of people from Argentina in 1994 (due to their country’s crisis at that time) came the Parilla restaurant. Meat lovers welcome–these restaurants specialize in the beef of their home country. The parilla is a grill, and it is here that the chef cooks tender arrachera as well as ribs and steaks. Huge plates piled with combinations of different grilled meats, onions, and chiles, accompanied by French fries, salad, and bottles of red wine and tequila, adorn the tables of jolly eaters. Surely, most international cuisine is represented in the city . The neighborhoods of Polanco, Condesa, and Roma are best known for the variety of ethnic restaurants dotting their streets. Italian, Lebanese, Spanish, Greek, French, Japanese–all are represented. If you’re in need of an Asian food fix, head for the small Chinatown in Centro, a few blocks from the Palacio de Bellas Artes. It’s inevitable that you’ll be drawn to the tacos and other treats found on the streets of the city, although many local residents do not recommend eating street food, including this author. Sanitary conditions are not the best since there’s no running water, and much of the food sits at lukewarm temperatures all day. But it looks and smells sooooo good. Well-known author of several books about Mexico City David Lida throws caution to the wind and loves to eat tacos al guisado on Calle Chilpancingo between Tlaxcala and Baja California Streets. Mr. Lida suggests tortas, flautas, and other tacos as safer choices if you can’t walk past the stands on the streets. And the prices? Dead cheap. Every neighborhood in Mexico has its own mercado (market) filled with flowers and fresh fruits and vegetables. Here you’ll also find small restaurants where the food is reasonably priced, homemade, and good. This is another haunt of locals. Popular choices in the markets are chile relleno, carne asada, and tortilla (or Aztec) soup, accompanied by plenty of beans and rice. No matter what venue you choose for your meals, your fellow diners will wish you “¡provecho!” (enjoy!) as they pass your table.